While not exactly the glamorous side of a marriage proposal, the idea of a prenuptial/ante nuptial agreement is something that most people who are about to be married should discuss. In case a marriage doesn't work out or one spouse dies before you have a chance to draw up a comprehensive estate plan, a prenuptial agreement can safeguard assets, protect one party from the other party's debts, and make any possible divorce proceedings go smoothly and without unnecessary rancor. 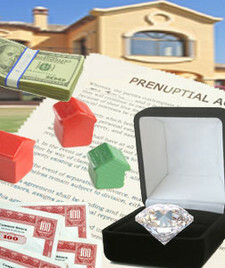 Some prenuptial agreements can cover day-to-day details, such as who will pay the mortgage and other bills or how to handle childcare. Since more couples are signing prenuptial agreements, you can discuss this openly with your intended spouse. If you both feel that a prenuptial agreement fits your situation, both of you should see a lawyer. Either of you has children from a previous marriage. You own a business or are involved in a family-run company. Either of you has significant assets that you want to keep separate. One of you is concerned about the other party's debt. You are giving up a lucrative career to get married. The agreement must be in writing and executed before the marriage and preferably in front of a notary public. Neither party should be put in the position of having to sign the agreement on short notice. If your future spouse confronts you with an agreement on the day of your marriage, it probably will not be enforceable. The agreement must be fair, reasonable, and based on full disclosure of all assets and liabilities by both parties. One lawyer cannot fairly represent both parties. Each party to the agreement should have their own attorney who can prepare/review the prenuptial document and answer all your questions before the signing. The sooner you prepare the prenuptial agreement before the wedding date, the better it will be for you and your relationship. The party who decided to broach this subject is likely to be suspected of lack of trust by the other party. Since more than half of all marriages end in divorce, a prenuptial agreement is a very practical document to have. It is not a doomsday prediction of your marriage's future. In fact, open communication with your new partner could be the best way to start a marriage. To set up a consultation concerning any pre nuptial or pre marital agreement, contact us online or call us at (201) 656-1000.